Relationships are at the core of our lives. They shape and refine our character. They influence our worldview. They're not just important to us as human beings--they're crucial. So it should come as no surprise that healthy relationships are the heart of a successful business or organization. And yet, many organizational cultures do not promote healthy relationships. 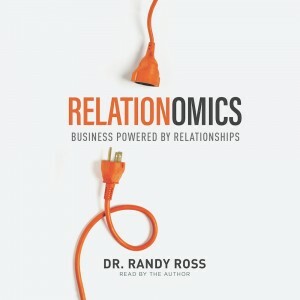 Those that do find that they enjoy greater effectiveness, reputation, and loyalty.In Relationomics, Dr. Randy Ross lays out the principles and practices that will help readers develop and sustain the kind of relationships that can build their business and energize their team, including how to- become a value creator- master the art of giving and receiving helpful feedback- dramatically decrease employee turnover- lead beyond self-interest- and much moreWhether you are building teams in a corporate setting or looking to build better friendships personally, the principles in this book will guide you toward becoming a healthier individual who attracts and builds healthy relationships.